The ENEL approved substations have the same characteristics of the monolithic ones, plus they have the ENEL approval. They are the following: DG 2061 (2440x4000x2600 mm), DG2081 (2440x2100x2450 mm), DG2062 (2440x3240 mm X2600), Torre (2500x2500x8000 mm). The roof is waterproofed with tar sheath, welded and painted with a silver bituminous paint. The natural ventilation of the cubicle is helped by ventilation windows to prevent condensation. The base is prefabricated and has a bathtub shape which allows the passage of the MV and LV cables inside the substation through suitable premade holes. One piece substation which allows to establish a network in HV. 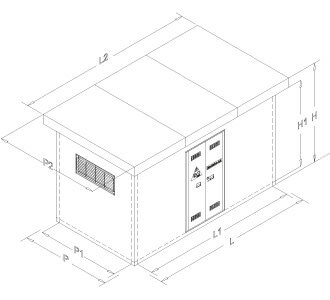 This substation is generally divided in an ENEL compartment for housing the power distributor’s electromechanical equipment and another compartment, intended for installation of the metering units. Its walls are 9 cm thick and the floor is 10 cm thick. The artifact, on request of the customer, can be equipped with a prefabricated monolithic tub, used as a passage for the entrance and the exit of the electrical cables. This type of substation is ENEL DG 2092 and CEI 0-16 designed and built. Their length varies from 250 to 750 cm, their width and height are standard 250x260cm. They are made in vibrated reinforced concrete and packaged with high strength cement suitably reinforced with 7 cm thick walls. They are internally and externally treated with quartz plastic wall plaster that confers high resistance to atmospheric agents. The roof is waterproofed with tar sheath, welded and painted with silver bituminous paint. The natural ventilation of the cubicle is helped by ventilation windows to prevent condensation. The base is prefabricated and has a bathtub shape which allows the passage of the MV and LV cables inside the substation through suitable premade holes. Formed by modular elements insulated with polystyrene and properly armed. These types, although requiring the assembly on site, have considerable advantage of being made of any size and in particular the panels can be customized with paints and finishes on request from patrons, and there is a wider flexibility in the choice of the layout design. Although it must be installed on site, the assembly is extremely easy and rapid. These are made in accordance with local regulations on manufactured goods in vibrated reinforced concrete: Law 1086/71 - DM 12/03/87 - Circular no. 31104 of 16/03/89 - 27/02/74 64 of the Act - Ministerial Decree 16/01/96. The projects are deposited in the Min. LLPP. 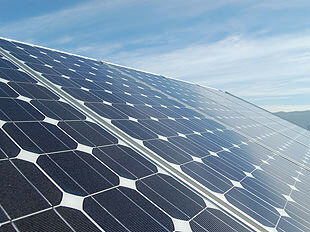 The products are also compliant with CEI 11-1 and CEI EN 61330. Eurotstrutture also provides cable conduits for all types of installation and with dimensions and forms that reach even real box-shaped ducts for subservices. It is qualified supplier FS-ITALFERR. 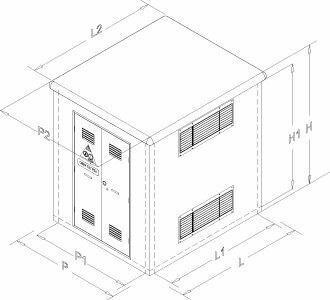 * The substation project displayed on this page is tentative and is intended only to be indicative, in fact the company invites you to consult it for specific project based on the prefabricated substation needs.